MAUI, Hawaii ­— So you came all this way and, oh, it’s raining. Hey, you’re still on Maui. Are you really going to get all cranky? Often you can drive a few miles — or wait 10 minutes — and you’ll have sunshine again. But there are days when spongy gray clouds cover the whole island and it’s not the beach weather you’d bargained for. “We’ve had a lot of rain — this whole year has been an anomaly,” said Brian Jenkins, manager of Napili Village condos, where we stayed on a recent visit. So you don’t have to hang in your room and watch bad TV. With advice from Jenkins and a little exploring, we found good things to do when the weather occasionally goes south. The 20-year-old Maui Ocean Center, centrally located at Ma‘alaea, is a just-right diversion for a moist day, especially if you haven’t yet been in the ocean but plan to snorkel or dive during your visit. On a 2015 trip to Monterey, California, I found this a perfect combination: Stop at the aquarium first to learn all about what you’re going to see, then get out on the water and appreciate nature all the more. The same sequence fits Maui. “I’m seeing more types of fish than I’ve ever seen before!” my wife exclaimed as we goggled in front of the Living Reef exhibit, full of gorgeous purple and green coral along with fish of every color and shape cruising by just inches away. “Look at that guy’s teeth!” she said, nodding at a passing wrasse. “Yes, a bit of an underbite,” I noted. There were fluttering butterflyfish, rock-threading needlefish and enough lemon-yellow tangs to fill a fruit stand. Toddlers loved the place, leaning with palms against the glass in wonder. “Respectfully in compliance” with a local ordinance prohibiting the display of intelligent cetaceans (dolphins and whales), Maui Ocean Center has much more of an educational slant than those tourist attractions where animals perform for whistling crowds. Naturalists educate visitors about using reef-safe sunscreens. And they practice “catch and release,” with every creature ultimately returned to the wild. Educational presentations are frequent — 20 per day, check the schedule online — along with cultural activities such as ukulele lessons, lei making, and even “Aquari-OM,” a chance to practice yoga in view of the Open Ocean exhibit (all included with aquarium admission). 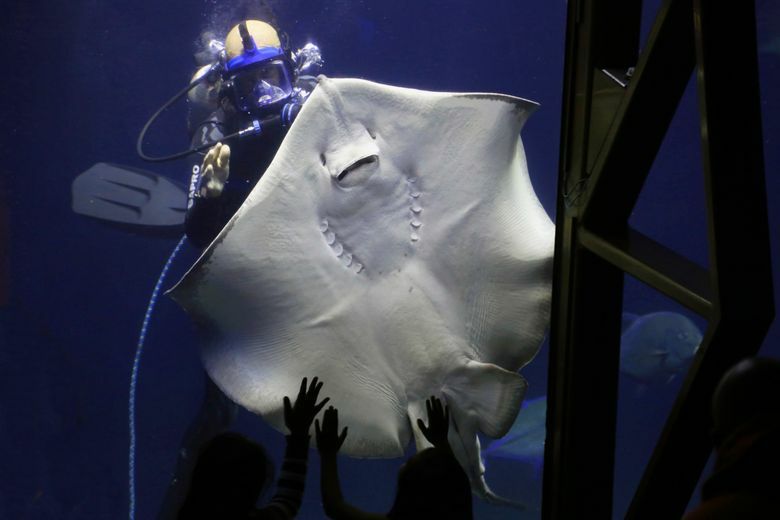 Don’t miss the twice-daily presentation (11 a.m. and 3 p.m.) by divers in the 750,000-gallon Open Ocean tank, full of sharks of many kinds, giant stingrays and hundreds of other fish. Are you a certified diver? Sign up for Shark Dive Maui and take a 40-minute dip in the tank yourself (starting at $199). Maui Ocean Center, 192 Ma‘alaea Road; 9 a.m.-5 p.m. daily, $19.95-$29.95; mauioceancenter.com. With rain clouds often come stormy seas, just the thing to fuel high spouts on the Nakalele Blowhole. 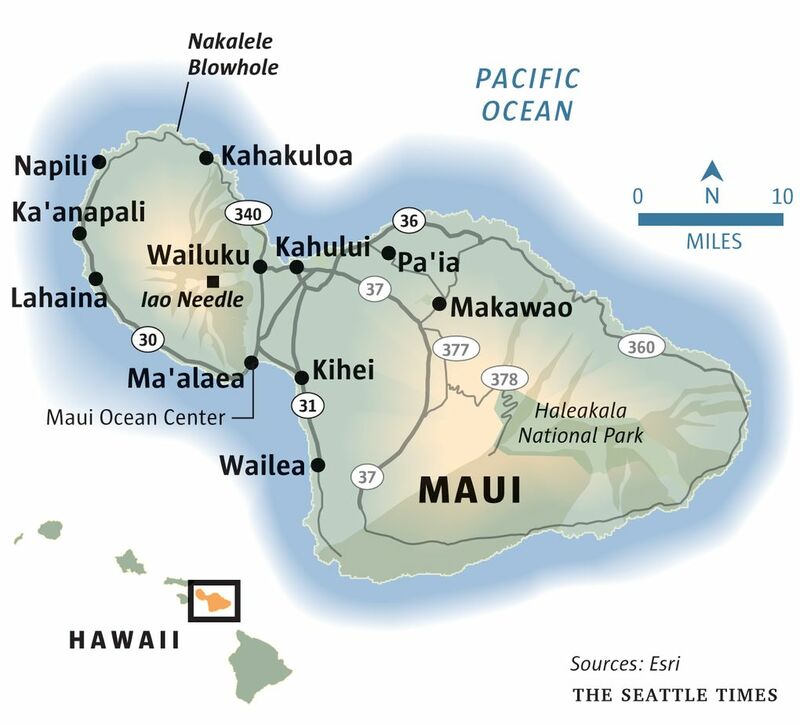 The blowhole is located off the narrow and winding road “over the top” — along the northern cliffs — of West Maui, which on a map looks like the head attached to the torso comprising the rest of the island. 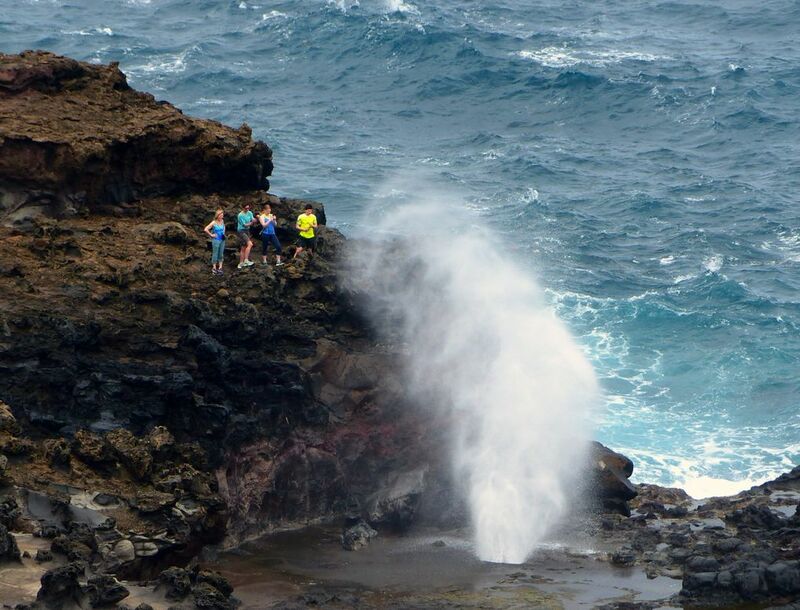 “Woo!” comes a high-pitched cry from onlookers when a gusher spouts 50 feet in the air. Then “woo!’ goes the blowhole, in a bass pitch, as air is sucked back in. Lava rock downwind of the blowhole is pockmarked like injera, that bubbly Ethiopian flatbread, from years of corrosive saltwater spray, making for a mysterious and unearthly landscape. Look beyond Lahaina’s T-shirt shops and ABC stores to discover some of the fascinating story behind this 19th-century whaling port that was once the seat of Hawaiian royalty. A good place to start is the admission-by-donation Lahaina Heritage Museum, in the Old Lahaina Courthouse, on the water side of the historic banyan tree (Hawaii’s oldest and America’s largest). Here you can shudder at wickedly pointed old whaling harpoons and get a quick grounding in the area’s history. In the gift shop pick up a $2 Lahaina Historic Trail map, including 65 sites scattered across town along three different walking “trails,” from 30 minutes to an hour each. Follow the map as you wish, or pick a few sites of interest. We liked the Wo Hing Museum, 858 Front St., an exquisitely restored, wide-balconied structure built in 1912 as a social and religious center for the island’s expat Chinese populace, many of whom came to work in the sugar fields. Be sure to step outside to the cookhouse for an added attraction: a showing of fascinating films shot by Thomas Edison during visits to Hawaii around the turn of the last century. 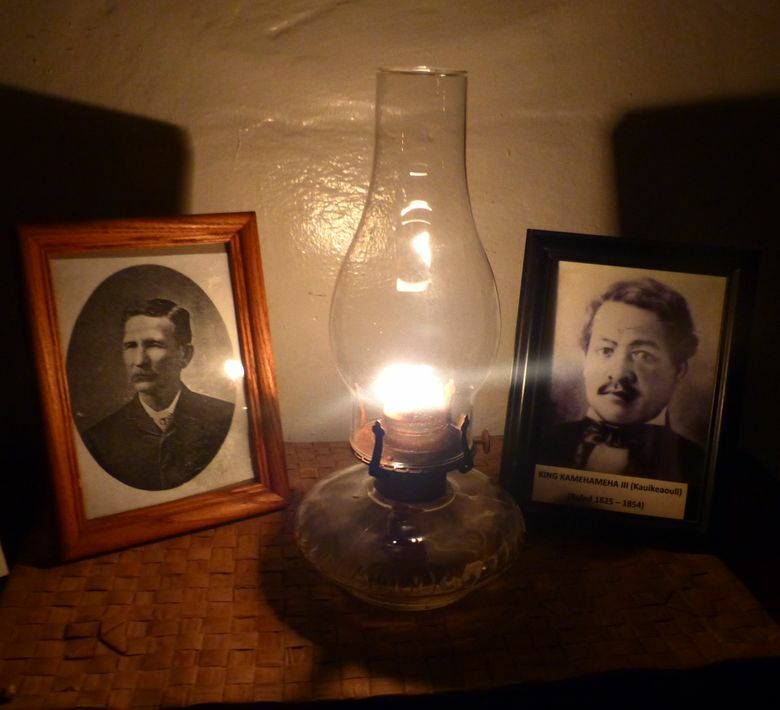 Our favorite stop, at week’s end, was the every-Friday-evening candlelight tour of the Baldwin Home Museum, at Front and Dickenson streets, a historic missionary home and the oldest house still standing on Maui. Here, the Reverend Dwight Baldwin — a physician as well as a clergyman — and his wife, Charlotte, raised six children. We peered into a case of Baldwin’s medical tools, including “forceps” resembling my father’s old tin snips, and something called a “surgical chisel” that made me gulp. “He served as a doctor, a veterinarian, a dentist, a carpenter, a reverend, a missionary, a dad and a part-time counselor,” explained Jackie Hala, a Maui-born Native Hawaiian with the Lahaina Restoration Foundation, who led us on a tour by the light of candles and lanterns. The nighttime visit really conveys what life was like in those days. “They went to bed when the sun went down and got up before dawn,” Hala said. 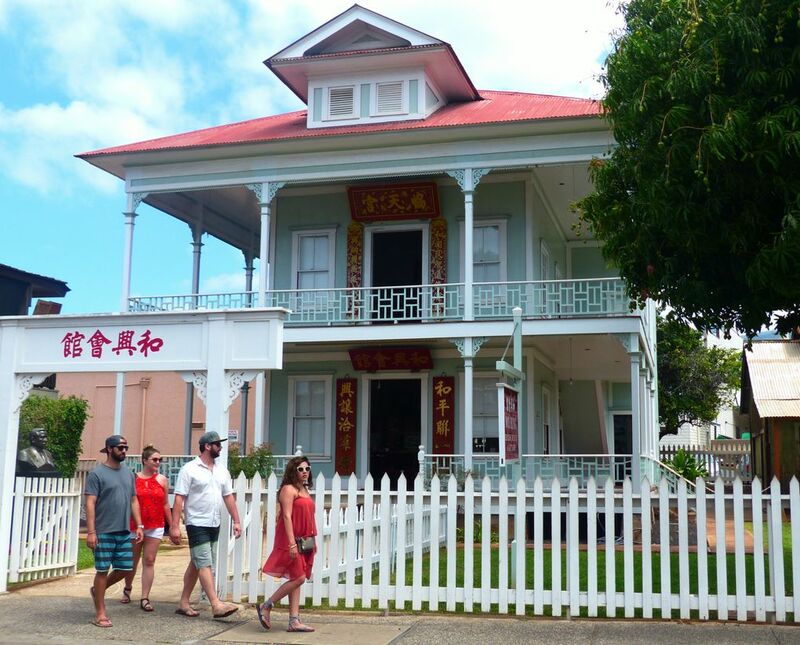 $5-$7 allows entry to both Wo Hing and Baldwin Home museums; free for 12 and younger; lahainarestoration.org. 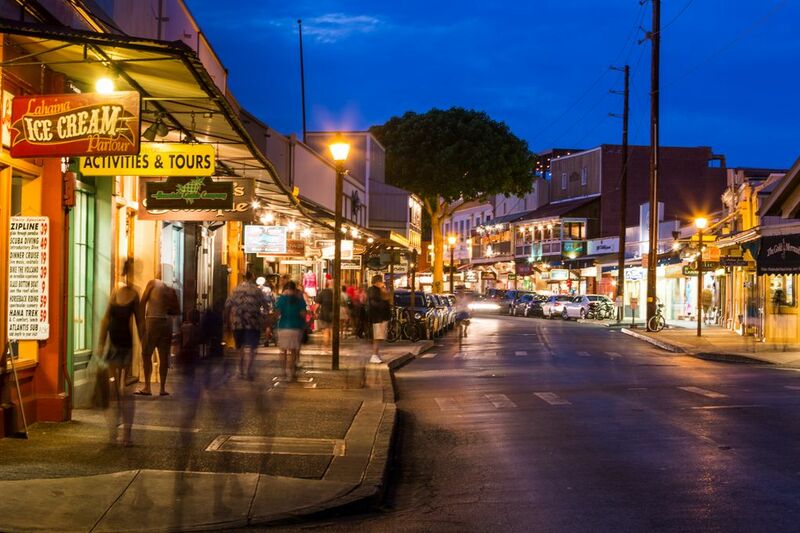 Rainy days are also fine for shopping in Lahaina, where you’ll find plenty of opportunities to lighten your wallet in clothing boutiques, high-end galleries, island-themed interior-design shops and more. 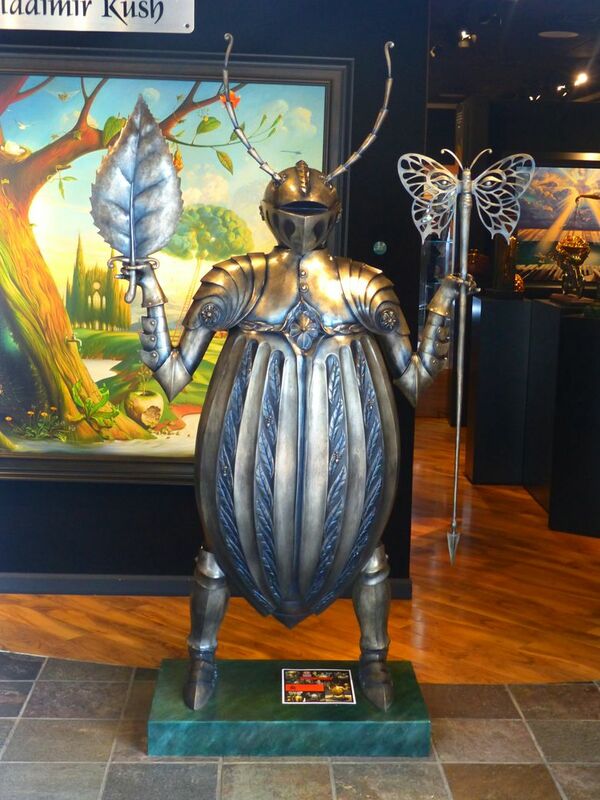 Start at the banyan and wander north on Front Street (there’s a large public-parking lot at Front and Prison streets). If you’re in the market for cheap T-shirts, we found the best deal at six for $20. Need some high-end sandals? Look for Island Sole, 728 Front St., whose sign shows a nene wearing flip-flops. Watch for Lahaina Galleries’ Maui-themed version of van Gogh’s “Starry Night” (incorporating palm trees and the old courthouse). There’s Rip Curl and Billabong, if you need board shorts, Sand People (“a coastal lifestyle emporium”) and much more. Among other Maui shopping: the newly renovated Whalers Village at Ka‘anapali (also home of Maui Escape Rooms, if you have seriously bored teens in tow); locally grown boutiques and galleries in the surfer town of Pa‘ia; and everything high-end (Tiffany to Tommy Bahama) at the Shops at Wailea. And stopping for lunch and an island brew is easy, whether you go for the five-napkin signature sandwich at Cheeseburger in Paradise, on the Lahaina waterfront, or ahi poke tacos at the newly opened brewery restaurant at Maui Brewing in Kihei (also a great place for a rainy-day tour). If you can’t fight it, wade into it. 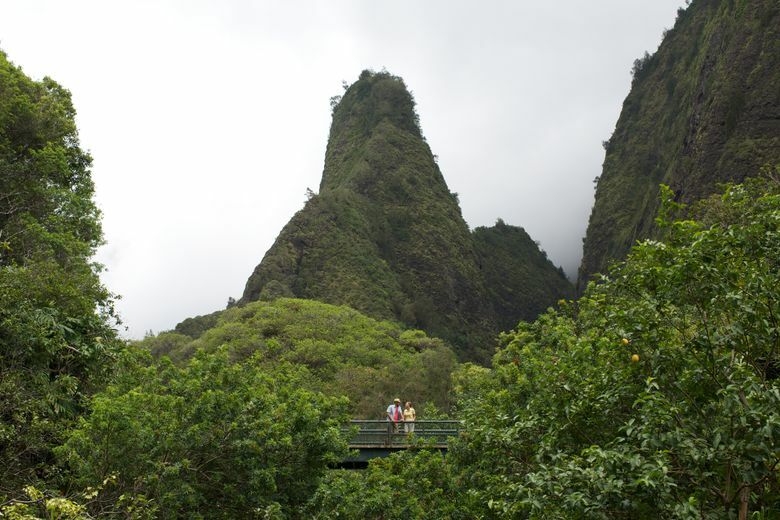 Head for one of Maui’s moistest, most beautiful places, the Iao Valley, where you might see the spectacular Iao Needle if it’s not lost in the clouds. We made our way here, at the end of Highway 32 west of Wailuku, in a downpour. The stunning geography was almost lost in billowing mists. But it was also one of the most peaceful places on Earth on a rainy day. Tip: Pack a poncho. Iao Valley State Monument, $5 parking fee for out-of-state visitors; st.news/IAO.